My dicentra is blooming right now in the shade garden and is so pretty. This time of year is perfect to paint botanicals as they should be done from the live plant, not a photograph. There are so many flowers blooming right now that there are plenty to paint. 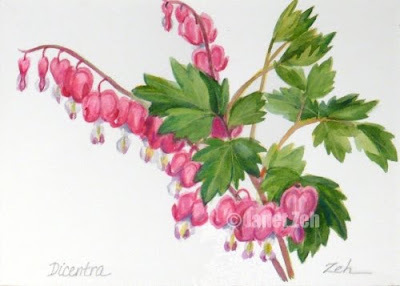 I enjoyed painting these bleeding hearts with their bright pink color. To the left are some I used as reference for this painting. This botanical watercolor painting is actually a mix of a watercolor base and a bit of colored pencil for highlights and detail. It is size 5"x7". You can get this painting or print at Shop.ZehOriginalArt.com in the botanical section. I hope you have a lovely day!